The book is available in Maynard at The Paper Store, ordered on line, as an e-book, or directly from the author. If from the author, the author makes a $10 profit and you get a signed book. Any other venue and the author (me) gets 70 cents. Maynard resident David A. Mark brings his years of experience as a writer to create this fact-populated collection of fifty short essays gathered into seven theme-linked chapters. The contents were originally published 2012-14 as Mark’s column in Maynard’s newspaper, the Beacon-Villager. I continue to write for the newspaper. In this, his second book, the content is 100% history. Chapters again cover the 19th, 20th and 21st centuries, plus a focus on the unusual people and unusual businesses that prospered here. So, from the question as to why there was a mink ranch in Maynard, to whether Babe Ruth came a-drinking here when he lived in Sudbury, here is David Mark with his well-researched and entertaining answers to those questions. AND BUY THE FIRST BOOK! 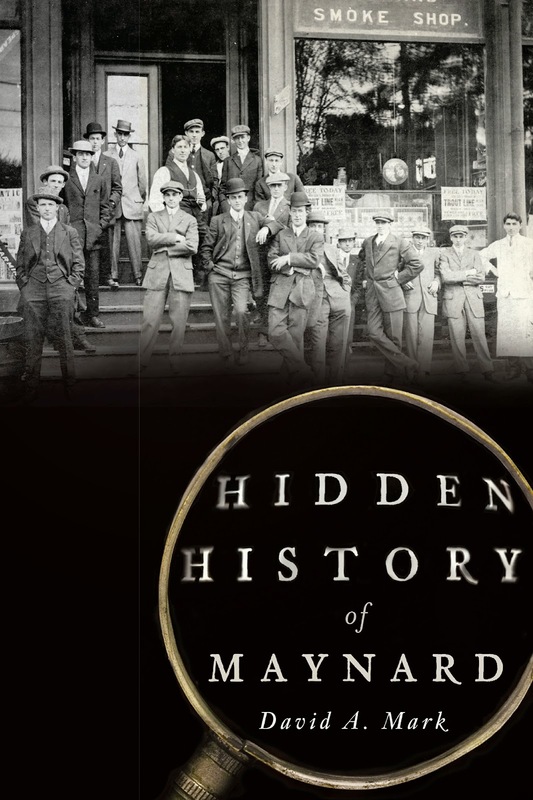 Maynard: History and Life Outdoors mixes 2/3 local history with 1/3 observations on nature and local recreational activities as a means of exploring what Maynard, Massachusetts offers to anyone willing to get away from too much time looking at screens and not enough time spent seeing, hearing, touching and smelling the life going on outside. History starts with eighteenth century stone walls, then carries forward to twenty-first century river clean-ups and farmers’ markets. Nature spans skunks to skunk cabbage, deer to deer ticks, and birds to bird food. Recreational sports essays range from describing the slow-motion, nightmarish feel of snow shoeing to how to avoid overhydration – the potentially deadly opposite of dehydration.